We took advantage of the long weekend for Memorial Day and decided to head south for a 3 days road-trip to Southern Oregon on Highway 101 and Northern California. We rented a “fabulous” family van perfect for our group of six, and started the road-trip on a Friday afternoon. After fighting the traffic we finally made it to Newport, Oregon late in the evening, just in time for getting drinks in one of the few bars still open at that time: a karaoke bar with local fishermen, funny dogs and interesting songs. The locals quickly figured out that we were new around there, and we were labeled as being the “weird strangers”. Cape Perpetual State Park: we got there at low tide and spent a bunch of time walking around the tide pools, looking at sea stars, mussels and all sorts of plants. We ended up hiking and almost bouldering on some of the rocks, ‘cause why would we ever take the easy way? The view of the coast was amazing, the sand soft and the tide pools full of life. First stop was definitely a great choice. The tide pools at Cape Perpetua - full of life! Shore Acres State Park, with nice botanical gardens and again, an amazing view of the coast. The girls in the group, we loved the formal gardens with perfect roses. A kid nearby described this visit as “Why would we ever visit somebody’s back yard?” , and I believe that was what the guys in our group thought as well, cause they were definitely not impressed by the gardens. However, if you are into flowers and man made gardens, definitely worth it. Cape Arago State Park was only few minutes drive away. When we got out of the car, we could clearly hear many loud seals around. Needless to say the views were amazing, and when we got to the shore there were tens of seals hanging out on a nearby island. Some of them in the sun, some of them swimming next to the shore. Cape Blanco State Park was one of the highlights of the first day. Maybe because of the wildflowers, the completely empty beach or the amazing views. Or maybe the fact that this park came right after lunch and a cold beer. Wildflowers, an empty beach and a random beatiful rock. What a perfect spot! When we got to our campsite in Jedediah Smith State Park later in the evening it was almost dark, but we could see and smell the tall trees around us. We closed the day with barbecue, music and bonfire and excited about the next day would bring. On the way to the next State Park, we grabbed lunch to go and stopped at High Bluff Overlook. The picnic area there made a great lunch spot, perfectly located before our next destination. Happy about the view, or after a delicious lunch? Probably both, plus the great company. We entered Prairie Creek Redwoods State Park on the scenic drive (called Newton B. Drury Scenic Parkway), where tall trees are guarding the road, and elks are quietly watching the tourists. Fern Canyon is a narrow canyon whose walls are fully covered with ferns, and I was looking forward for a quiet walk in this magical place. It turned out I was not the only one with this plan, and the Canyon was extremely crowded. During the few moments with no people around, I got to absolutely love what I was seeing, the green surrounding everything, the small waterfalls from the walls and the wet smell. It's like a Canyon. But with fern instead of rocks. The Golden Bluff Beach seemed to be a wonderful place and had an amazing campground, and I hope to come back there one day and enjoy the quietness of the place, the soft sand and watch the elks living there. Elks are such wonderful animals! Please, human race, don't be stupid! Our campsite for the night was Oak Bottom Marina in Whiskeytown, and we got there late in the evening. The outside temperatures made it clear that now we are in California, and we had a great evening at the bonfire, playing "guess the artists" and laughing until late in the night. On Memorial Day, everybody was excited to swim in the lake next to the camping and the fact that the water temperature was a bit too refreshing didn’t stop us. That morning finally felt like real summer: beach, waters warm enough for swimming without a wetsuit on and outside too hot to stay for too long in the sun. The last stop of the trip was Lassen Volcanic National Park. We entered the park from the west side, and since the road was closed only 10 miles later, we only got to see part of the park. Although we only spent little time here, we got to enjoy the beautiful Manzanita Lake and to walk the Devastated Area Trail. We learned a bit about the eruption that took place one hundred years ago and admired the contrasting views in the park: devastated forests, a tall snowy volcano, a clear lake at the bottom and very young rocks (100 years old is really young for a rock!). But good things come to an end and it was time to embark on the long drive back to Seattle and get back to our responsible adult lives we have over the week. 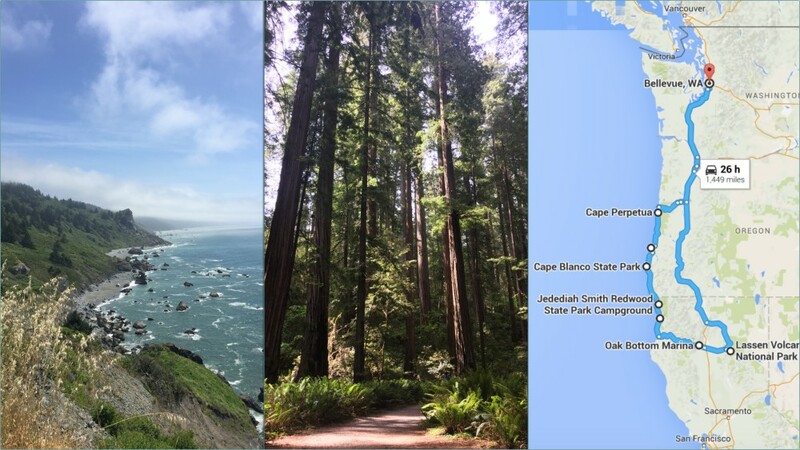 This has been a great road-trip - we loved the coast, the redwood trees and the National Parks in Northern California. We all wished we could have skipped the long ride back and stayed a bit longer in sunny California instead.